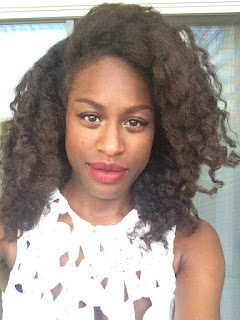 FroBunni: Sodium hydroxide in a natural hair line? Sodium hydroxide in a natural hair line? Welp, I'm sure this is a hiccup. The other day, I was scrolling Naturally Curly, and I noticed an interesting question asked about Aunt Jackie's Don't Shrink. Elongating Flaxseed Gel. Yup, as you can see, it says "sodium hydroxide," also known as lye. To be honest, this wasn't really shocking for me. I suspected it wasn't in there with the intention of loosening a natural's curls, but Naturally Curly's response begged to differ. 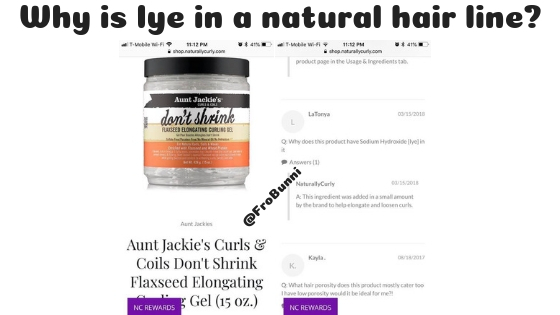 I had to pause for a moment to consider two questions: why does Aunt Jackie have sodium hydroxide in a line for naturals, and why was Naturally Curly saying it was to loosen curls? I darted over to Cosmetic Info to figure out the real reason. Sodium hydroxide is added to cosmetics to balance pH, and a lot of its forms are in other products, such as Milk of Magnesia. This makes much more sense, but it didn't necessarily answer my question. I fully understand why sodium hydroxide was added to the gel, but I didn't know why a natural hair company would add lye into a product meant for naturals. It just seems like a blip in judgement. I get it; there's a reason cosmetic scientists exist. Product formulations aren't as easy as DIY enthusiasts make it out to be, but I feel like Aunt Jackie's should know their audience enough to know that this was not the best judgement call. There are other pH adjusters, such as citric acid, so I'm sure accommodations could've been made (of course, with a lot of money and time invested). I also wonder why Naturally Curly answered the way they did. Was this answer really from the company? Because if so, I question their judgement even more, and would honestly recommend people consider finding a different gel. But if not, why not contact the company before answering? Why make an assumption? It would seem imperative that this be answered correctly and in a way for the average consumer to understand its purpose. All in all, this is a marketing issue, and maybe that's why I'm writing a post about it (marketing being my career and something I'm passionate about). A lot went wrong here, and I truly believe that was no one's intention. But, as the saying (or meme) goes, impact is greater than intent.